In February 2014 I was privileged to minister in Yangon, Myanmar (formerly Burma). One of our teaching sessions focused on the life of Ann Judson, the first American woman overseas missionary. By age 21 Ann held a deep desire to serve God on the mission field in a foreign country. However, when Adoniram Judson, an aspiring missionary, asked her to marry him, she did not immediately accept. Ann needed God to confirm she was being called to the mission field not as a missionary’s wife, but as a missionary in her own right. Ann must have been satisfied that God was indeed calling her because in early 1812 she married Adoniram and within days they set out on the four month journey to Calcutta, India. She faced serious opposition from Christian friends and family over her decision to serve God in foreign lands. This was a time when missionary work was considered to be the sole domain of men and many Christians were shocked that a woman would even consider herself called to the mission field. After a year and a half in India it became clear the Indian authorities would not receive them, so the Judsons journeyed on by boat to Burma (now known as Myanmar). During the journey Ann gave birth to a still born child. When Ann arrived in Burma’s main city, Rangoon (now Yangon), most of the population had never laid eyes on a white woman. They crowded in around her, peeking beneath her hat, laughing and chatting in amusement at this strange white creature. The Judsons faced many difficulties in their new home. On top of the debilitating heat and unfamiliar culture, Burma was ruled by an oppressive king who governed the populace through fear. Mass executions, torture, and government corruption were commonplace. The Burmese royal family was overtly hostile to any religion apart from Buddhism, which taught that there is no eternal God. There were no words in the Burmese language to express the concept of a God with no beginning and no end. Ann and Adoniram worked hard studying up to 12 hours a day for two years learning the difficult language. Eventually Adoniram produced a gospel tract in Burmese and commenced working on a Burmese translation of the New Testament. Ann authored a Burmese language catechism, translated the books of Daniel and Jonah into Burmese, and began to teach women’s Bible classes. She was also the first person to translate Bible passages into Siamese. They preached the gospel and started a school, but it was six years before they saw their first Burmese disciple, a man named Mong Nau. Women believers were also added but as so often is the case in history, their names were not preserved for us. Soon more Burmese were discipled and baptised. During this time Ann also gave birth to a baby son, Roger, who sadly lived only eight months. Ann labored steadily for several years until 1821, when, deteriorating health forced her return to the United States for much needed medical treatment and rest. The long journey, via India and England, kept her away for two years. In 1824 Ann returned to Burma to find the political situation volatile. With war between England and Burma threatening, Adoniram and fellow missionaries were summoned to the king’s palace and detained within the then capital, Ava. Ann commenced a girl’s school, but soon their situation worsened when her husband was suddenly imprisoned on suspicion of being an English spy. Adoniram was kept, heavily chained, with other foreign men in a disease ridden prison where torture and executions were a daily occurrence. Ann, stripped by the Burmese authorities of all furniture and belongings, was left to fend for herself in a small house, under guard. She would walk two miles to the prison each day praying and constantly petitioning the ruling authorities for the release of her husband and the other foreigners. Sometimes she was allowed to see Adoniram and at other times she was denied. As the English advanced on Ava, Adoniram and the other missionaries were suddenly marched out of the city to Amarapoora, a remote place in the country, where it was rumored they were to be buried alive. Ann immediately set out in pursuit, along with her three month old baby, a Burmese helper, and two young girls for whom she was caring. Arriving in the remote village with no food or shelter they survived by staying in the two room hut of the jailer, where they slept on the floor for six months. During this time Ann became desperately ill and one of her young companions contracted small pox. She cared for the girl until she died, while continuing to visit the prison each day to care for Adoniram. Adoniram was condemned to be executed, but God intervened. Instead of facing execution, Adoniram was unexpectedly summoned by royalty to mediate a peace agreement between the British and the Burmese, as he was one of the few people who could speak both the English and Burmese languages. Reunited, the couple spent a brief two weeks together before Adoniram was sent away by the authorities to help with peace negotiations elsewhere in the country. Tragically, in October 1826 Adoniram returned to find Ann had died in his absence. Though only thirty seven years old, Ann’s physical health had been broken beyond repair. Sadly, their baby daughter Maria also died only a few months later. At the time of her death Ann had no one beside her but a handful of loyal Burmese Christian women whom she had discipled. She was buried under a majestic tree at Kyaikkami (formerly Amhurst) where she had first landed in Burma. 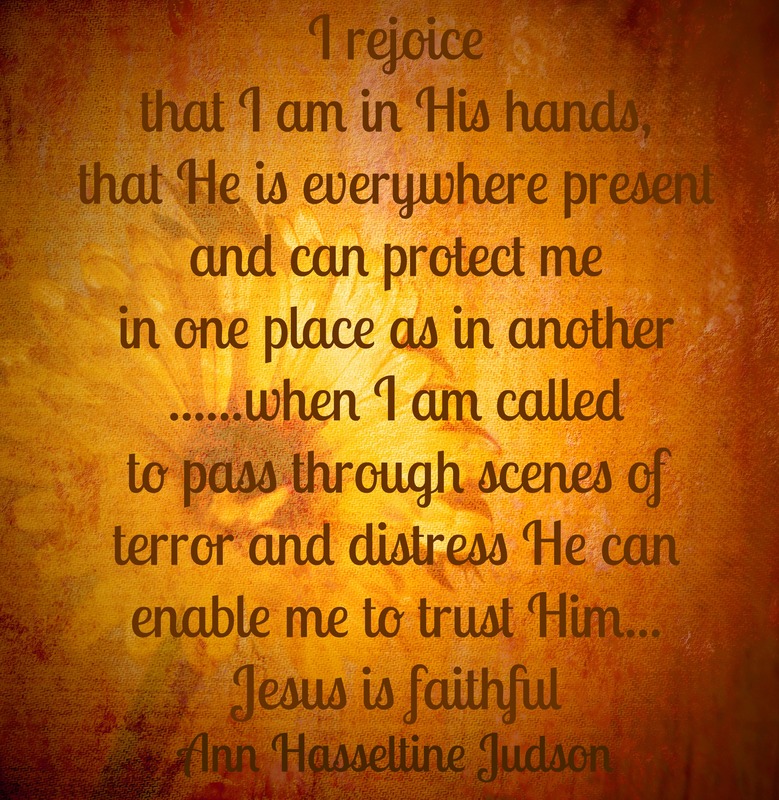 Ann Judson was a deeply dedicated Christ-follower, as well as a gifted teacher, linguist, preacher and author. She was instrumental in establishing a Christian church in Burma which, though heavily persecuted, still thrives to this day. She championed the cause of female education, starting a Burmese girl’s school and tirelessly petitioning Christian sponsorship for her girls during her medical furlough in the United States. As I stood, in early 2014, listening to the beautiful worship of Burmese Christians, I was intensely aware of Ann’s enduring legacy. Today there is a Christian community in Myanmar because a woman heard the call of God and, against severe opposition, responded. Like a grain of wheat planted in Burmese soil, God has ensured a rich harvest from Ann’s short but extraordinary life (John 12:24). 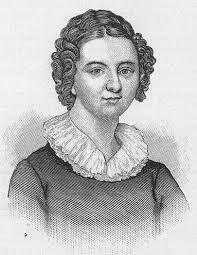 Ann Hasseltine Judson, we salute you! I love learning of the lives of these bold and beautiful-spirit women who have gone before. Thank you, Cheryl. My heart ached for Ann and Adoniram throughout your well-told chronicle. Ann, and the two of them as a couple, knew great loss. I believe the Holy Spirit ministered deeply to their hearts and they knew great joy with Him, perhaps never uttered; but they knew. The burst of harvest that remains to our present day is testimony that their faith and following of Christ was surely rewarded. I agree. We are fortunate to have Ann’s story because she was a prolific writer and sent many letters back home, as well as keeping a diary. There are so, so many other women in the ‘great cloud of witnesses’ whose names we don’t know and whose stories aren’t told because the lives of Christian women were generally considered not worth documenting (by men), especially prior to the last 100 years. Women need to be told these stories, and to tell their own stories as well. Hence: Ishshah’s Story!